From the Archives: Photographs by William Fox from the Fordham University Archives and Special Collections brings together seventeen contemporary digital prints made from the original negatives housed in the Archives at the Rose Hill campus’ Walsh Family Library. William Fox was a professional photographer who worked for Fordham University on a freelance basis for upwards of twenty years generating photographs that span a range of topics from commencements, to classrooms, and from campus architecture, to student life. The varied images presented in this exhibition were all created between the years of 1940 and 1941. Fox’s negatives were all made to the exacting standards of the time with a large format, tripod mounted camera and provided an impressive level of fidelity – a task requiring considerable craft. The fact that the negative emulsion has separated, cracked, and deteriorated is not due to their care, as archival standards in archives only developed in the 1980s, but due to the instability of the materials themselves. That we have them at all is a small miracle and testament to the good care provided by those that have worked at the Fordham University Archives and Special Collections over the years. 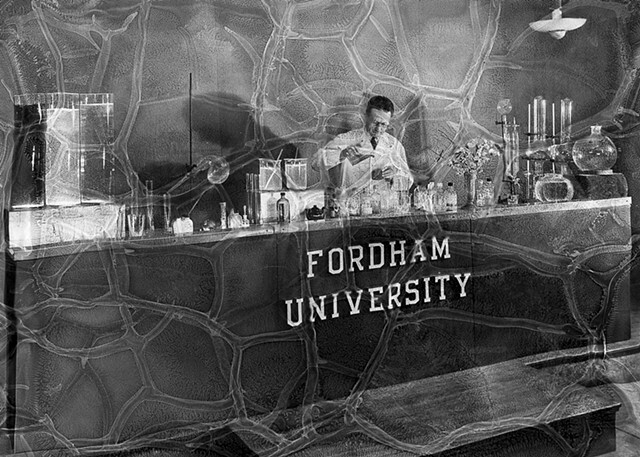 The images in From the Archives are a small sample selected from thousands of negatives made by William Fox and represent the beginnings of Fordham University’s self-awareness, from a publicity and photographic point of view. His photographs documented the growth of Fordham University over an extended period and gave shape to aspects that the university valued up to and through the tumultuous times of World War two. It should be emphasized that not all of William Fox’s negatives evidence deterioration. The curatorial choices here intentionally highlight the flaws of the analog process for their mystery and visual beauty, in contrast to our digital age of precision and perfection. Special thanks to Patrice Kane, Head of Archives and Special Collections at Fordham University for her expertise and continued assistance.